Highlighting technical knowledge now available in Greece, this interesting project featured two access roads to the bridge which required the construction of four soil reinforced structure walls, for which Maccaferri’s MacRes system solution was deployed. 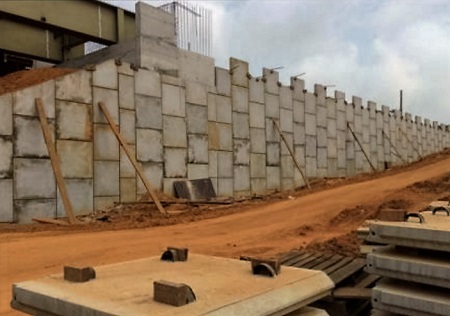 MacRes consists of a vertical concrete fascia panel of dimension 1.50×1.50m connected to a high resistance geosynthetic strip, Paraweb, which is BBA certified and CE marked. In addition to the provision of design support and detailed Installation Manuals, France Maccaferri visited the jobsite on numerous occasions to support the contactors during the precasting of the concrete panels, in addition to being present at the beginning of the installation of the MacRes system. The MacRes product offers relevant advantages for infrastructure as its vertical fascia and the durability of soil reinforcement reduces the required footprint of infrastructure works and provides a log design life; keys to infrastructure clients. Additionally, it is user-friendly and quick to install, the Paraweb geosynthetic strips are corrosion free with a design-life of 120 years and, ultimately, it drastically reduces the amount of steel and concrete materials as well as reducing transport costs to supply the job site. Moreover, Maccaferri France has designed the project by using an internal software, which is specifically intended for this solution. Read the Case history present on the Maccaferri France’s website.